Fagrell brothers join the Titans ! The Temiscaming Titans are extremely pleased to announce the signing of two new players from Ytterby, Sweden. Felix & Hampus came to visit Temiscaming early in the season with their parents and practiced with the Titans. The coaching staff and ownership group saw some potential in both players. Felix, a 20 year old center, at 6’1″ 190lbs played for Hovas HC J18 (div.2) and Hovas HC J20 (div.1) in 2014-15. Meanwhile Hampus is a 19 year d-man, 6’2″ 180lbs who played for Hovas HC J18 (div.2), Hovas HC J20 (div.1) and Hovas HC (div.3) during 2014-15. 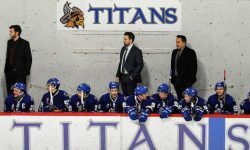 Both players demonstrated a hard working ethic and determination that the Titans are looking for in all their players. Please join us in welcoming Felix & Hampus to Temiscaming and to the Titans organization.